Brace yourselves,… summer is coming. As we edge closer to the end of May, we also edge closer to summer vacation for school-aged children. If this is your very first summer dealing with the monumental task of keeping a child even partially entertained every day for all of June, July and August, then may God have mercy on your soul. Us ‘Summer Vacation Veterans’ know how difficult it can be to take a child who is used to being engaged all day, every day, at school, and toss them into the endless cycle of ‘sleep late, whine, complain, sleep late again’. But fear not, brave parent! There’s an app for that! Released on the last day of April, an app called “Little- Raise Happier Kids” may just be the solution you’re looking for! The app focus is to bring parents and kids closer together by suggesting fun, innovative activities that children can do alone or together with a parent. Each activity is age appropriate and sometimes includes an accompanying video or story. Activities include prompts like: “Take out one or two wooden spoons and help your child drum on saucepans”. 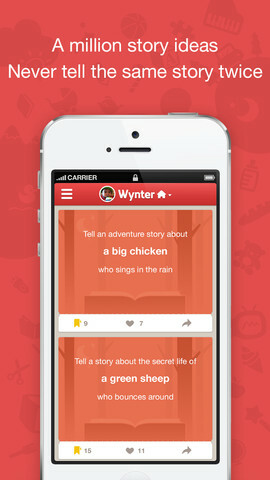 The app even includes “millions” of storytelling ideas for parents such as, “Tell an adventure story about a big chicken who sings in the rain”. The app supports different profiles for families with multiple children so that activities that are suggested are always age appropriate and engaging for that particular child. Wanna know the absolute best part about this app? It’s FREE. Yes, it will not cost you a single dime to have months worth of engaging play and story ideas delivered straight to your iPhone. Look at you! You might actually be prepared for the impending chaos that is summer vacation. I said might. To check out ‘Little- Raise Happier Kids’, click the Apple iTunes App Store button below. This app is for iPhone only.